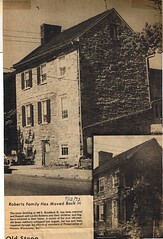 The first successful preservation effort undertaken by PHW in the 1970s was the fundraising effort to save a vernacular limestone dwelling on South Braddock Street. According to Quarles’ The Story of One Hundred Homes in Winchester, Virginia, the house at 409 South Braddock Street was constructed circa 1835, most likely by William Lawrey, and subsequently had been owned for about 75 years by the Lawrey family heirs. 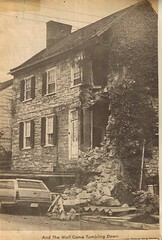 By 1971 the home was in need of structural repairs. The owners, Russell and Lucy Roberts, had started the process to repair the building before the damage became too severe. They engaged a contractor to initiate repairs to the cracked northern wall. However, it was to be some time before the contractor finished a prior project and could start on their home. After about a year, the reconstruction efforts were complete and the Roberts family was able to return to their home. (4) The building remains one of Winchester’s excellent examples of local limestone construction with no hint of the disaster that once befell the property. It was tangible validation that preservation worked and the community was willing to financially back an appropriate effort. The much-discussed idea of purchasing buildings through a PHW-driven revolving fund to save them directly seemed like it could become a reality. The catch? Finding the right project, then buying it. Previous Previous post: Happy 50th Birthday, PHW!